eWAVE3107 is a 1U Mini chassis type multi service platform which have flexible configuration. eWAVE ’ s WDM product lines supports multi service traffic and hence it’ s specially designed for carriers and service providers who require a very cost effective and highly reliable network. The system is adopted with WDM technology and goes up to 40Gbps transmission capacity. It supports transport of 1G, 10G Ethernet and OC3, OC12, OC48, OC192 SONET. With such well balance performances, eWAVE3107 is the price performance leader in optical transport market. This chassis is equipped with hot pluggable line cards with maximum of 8 channels. The client side ports are implemented by SFP, XFP or SFP+ modules. Single pair of fiber transmission is possible by using CWDM/DWDM technology. This chassis is equipped with 7 slots of hot pluggable line cards with maximum of 8 channels. The client side ports are implemented by SFP and SFP+ modules. 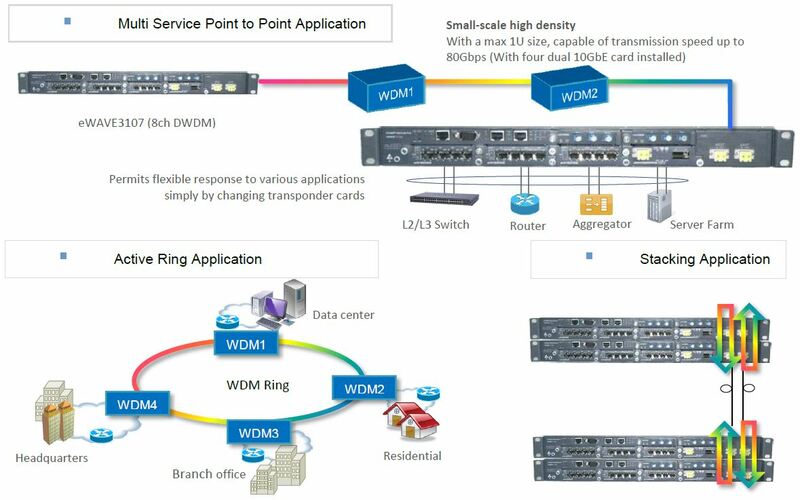 Single pair of fiber transmission is possible by using CWDM/DWDM technology. The system is employed with standard-based management protocols such as Graphic User Interfaces (GUI), CLI and SNMP. These can be accessed either though RS232 or Telnet via TCP/IP. User can configure and monitor the system remotely. This also allows eWAVE3107 to be easily integrated into existing EMS system as a plug-in network element. © 2017 eWAVE Networks Limited. All rights reserved.